Sometimes it is best to go for the simple things in your life. 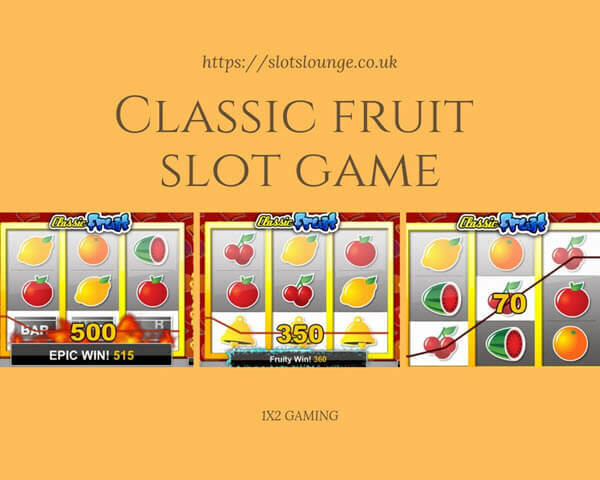 Classic Fruit slot game by 1×2 Gaming is one of such choices. This five reels and five pay-lines slot is one of the simplest and easiest games from fruit genre based games. Classic Fruit is the epitome of simplicity combined with state of the art graphics. In order to keep this game simple, 1×2 Gaming has omitted majority of the features commonly available in all other games. As you can guess from the title, this game revolves around fruits, seriously lot of fruits! The best thing about the five pay-lines provided in this slot is that you can select their number for each spin ranging from a single pay line to five of them. The reels of this game are designed in 3×3 format. These symbols are designed as very highly detailed ones with their natural colors. The three reels of this game are encased in a yellow colored frame. The background of the reels depicts bells, sevens and fruit signs in the form of a wall paper. The spin button is accompanied by a stack of gold coins on the right sides and all the five pay-lines are on the left side of the reels. A jingle bell like symphony played by an orchestra accompanies the game which makes it even more interesting. Overall Classic Fruit is a low to medium variance game which makes it suitable for all types of players. Classic Fruit slot game comes with a fixed jackpot of 200x. As mentioned earlier, in order to keep this slot simple, the developer has not provided any of the usual features such as scatters, multipliers, free games or wild symbols. There is auto play feature which can allow a player to opt for up to 250 spins. The maximum coin limit for Classic Fruit is set up at five coins. The coin range starts at £0.01 and goes up to £1.00. The minimum wagering requirement for each spin starts from £0.05 and ends at £25.00 while playing with five pay-lines. The high paying symbols of this game include a seven, a bar, a bell, a watermelon and a plum. The seven symbol provides the biggest payout of 200x of this game. The other high ranking symbols provide payouts in the following ways. Bar symbols: Landing three on an active pay line awards 100 coins. Bell symbols: Landing three on an active pay line awards 70 coins. Watermelon symbols: Landing three on an active pay line awards 54 coins. Landing three plum symbols on an active pay line awards 46 coins. Cherries: Landing two or three symbols on an active pay line awards two and fourteen coins respectively. Lemon: Landing two or three symbols on an active pay line awards three and twenty four coins respectively. Tomato: Landing two or three symbols on an active pay line awards four and thirty two coins respectively. Orange: Landing two or three symbols on an active pay line awards five and forty coins respectively. Scatter Symbol: Classic Fruit slot does not have any kind of scatter symbols. Wild Symbol: Classic Fruit slot game does not have any wild symbol. Classic Fruit slot game does not provide any type of bonus game, free games, re-spins or gambling options.